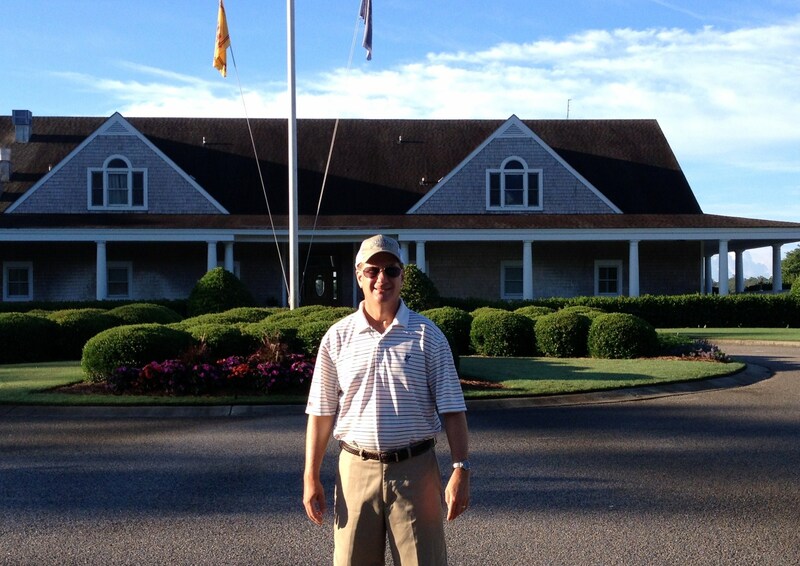 We played Glen Dornoch Golf Links in North Myrtle Beach, SC on Thursday, June 11, 2015. This was our second of four rounds on the Glens package which is one of the best value plays in the area. 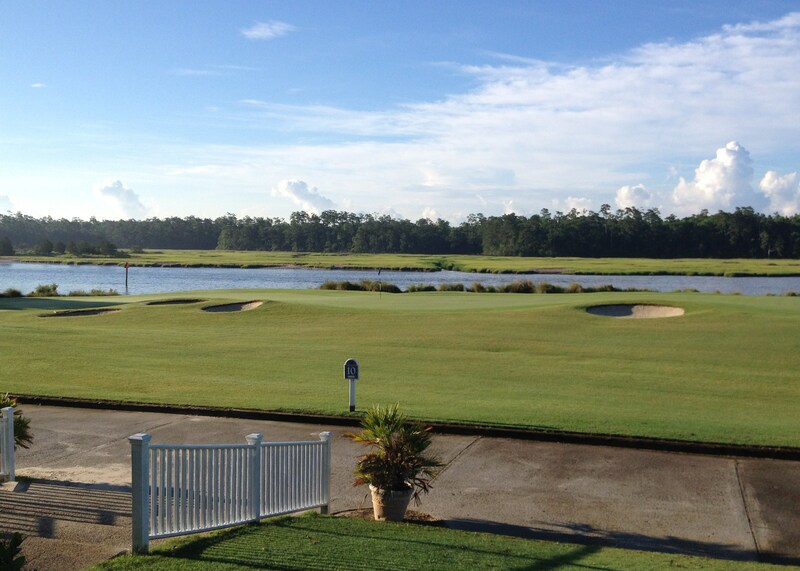 Every visitor to the Grand Strand should make it a point to play Glen Dornoch because the layout is unique, the party-like atmosphere along the Intracoastal Waterway is very entertaining, and the course has an outstanding set of finishing holes. We arrived for our 8:00 a.m. starting time and there weren’t six cars in the parking lot. As we warmed up on the all grass driving range, we completely had the course to ourselves and did not feel rushed at all. 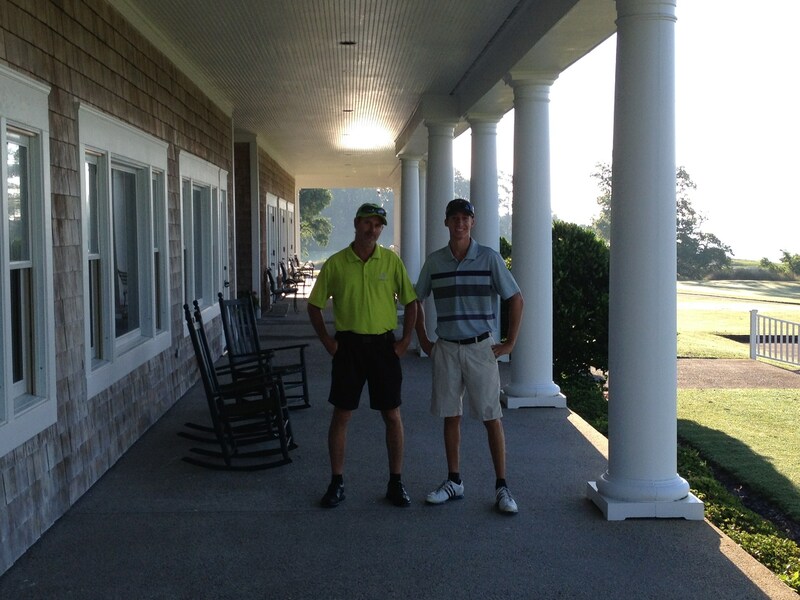 I believe we were the first two groups off, and didn’t see another set of golfers until our replay round after lunch. As it turned out, this was a hot and humid day and Glen Dornoch was playing wet and long. One of the big challenges on this trip was playing on different conditions at a new course every day and Glen Dornoch fit the bill, especially after playing in the wind and hard fast surfaces at Pawleys the day before. We immediately noticed our approaches making huge ball marks and felt we could attack the flags without hesitation. The course opens up with four fairly easy holes to let you ease into your game and then hits you upside the head with a 560 yard par-5 and it’s game on! As you move through the front, you come to #8 which is a brutal dogleg right par-5 that plays 540 yards into the wind coming off the waterway (photo below of the approach shot). It’s followed by the long par-4 ninth, that parallels the waterway and demands power and accuracy. 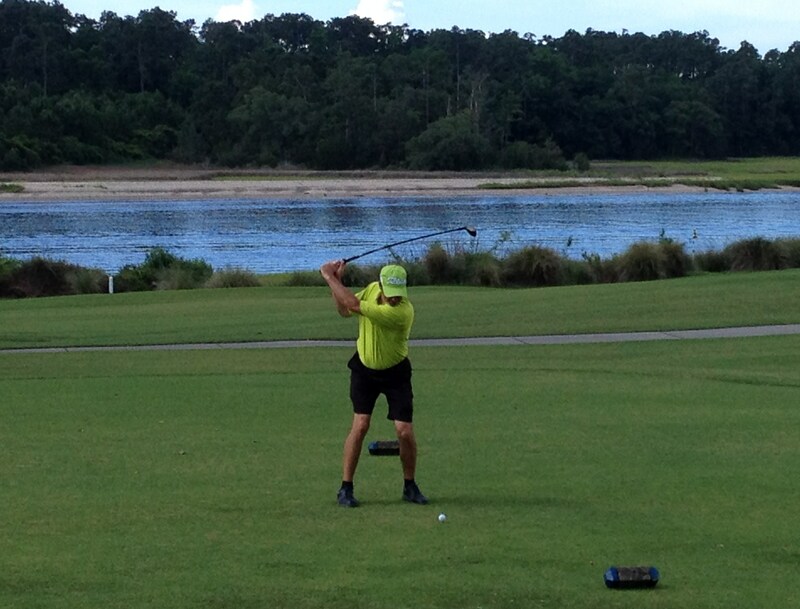 The entire course is about placement off the tee, but requires that you drive it solid to get in the correct positions. #16, 17, and 18 are some of the toughest finishing holes on The Strand. #16 is a downhill par-4 of 413 yards with ample room to land your drive. The yardage book says favor the right but the left is a better spot. Wherever you play from, when you arrive at your ball, you are faced with an approach to a target about the size of a gnat’s rear end – good luck! #17 is a 182 yard par-3 that plays into the wind with trouble everywhere, and #18 is a par-4 of 427 yards with a split fairway that dares you to hit it about 230 yards on the left route to clear the marsh and get a shorter shot in. I played the bailout (chicken) route twice but managed to par it both times using my lob wedge, which was the highlight of my afternoon. If you can play the last three holes in 2-over par, you are doing fine. The Glens package (see Shaftesbury Glen review) is an incredible deal. For golf nuts and enthusiasts who are crazy enough to play 36 per day for six straight days, the prospect of free golf in the afternoons is tempting. The state of the national golf economy is in general decline but there are some deals to be had in Myrtle Beach, and this is probably the best package we’ve ever played on. The clubhouse at Glen Dornoch is of modest size and has a decent grill to get your food. Complimentary lunch on the package was a sandwich or hotdog, soda and chips. The choices didn’t vary much from course to course, although they did offer pizza at Shaftesbury Glen. You can eat inside or take it on the porch and enjoy watching the players finishing on #9, or just hang out and enjoy all the sightseeing boats and jet skis flying up and down on the Intracoastal Waterway. The boat horns, occasional music, and jovial atmosphere make play along the finishing holes entertaining and unique. There was the same minor issue with non-inclusion of sand mix on the golf carts, as was the case at all the other Glens courses. Again, if you are playing on Bermuda fairways, you should be filling your divots. We paced ourselves easily in the morning round and played in a little over four hours. Again, we had the course to ourselves except for frequent visits from the beverage cart, which was appreciated because of the heat and the need to stay hydrated. There was a good supply of cold water coolers around the course at regular intervals. It was definitely a slow day at the course, but the small cloth bags for range balls that we had used in the morning were still littered about the range as we teed off for our afternoon round. While very minor, the staff should have cleaned up the range area and kept it looking sharp. We actually ran into a couple groups in the afternoon round, but we were playing as a twosome and decided to pace ourselves a bit and give them room. On this day, we played the blue tees at 6,446 yards which played to a par of 72 and a course rating of 71.2/137. I carded an 83. Glen Dornoch was a great place to spend 10 hours on a hot lazy Thursday afternoon. I will be back! 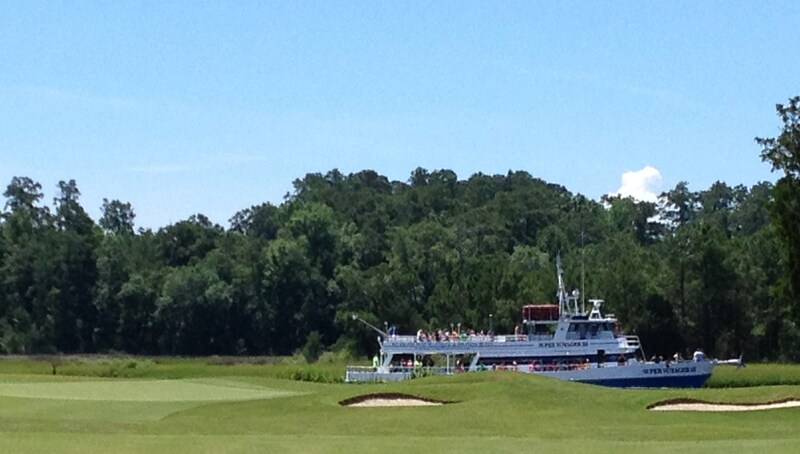 Party boat behind #8 green. This entry was posted in Course Reviews, Myrtle Beach and tagged course review, Glen Dornoch, Golf, Myrtle Beach, photography, sports, travel. Bookmark the permalink. This course looks like a lot of fun to play! The pictures are very good. Jim thanks. My buddy Mike was complaining about the pic on the first tee showing a minor reverse pivot. I guess the camera doesn’t lie!